This research project is using a synthetic schlieren technique to study the effects of shock waves on high-speed air travel as part of a larger NASA effort to develop a quieter supersonic vehicle. Conventional schlieren techniques typically require expensive lighting, mirrors, and precise alignment to visualize density gradients and enable shock wave visualization. This technology instead uses computer image processing technology and a less expensive background-oriented schlieren (BOS) technique to visualize shock waves in a wind tunnel. (BOS requires only a charge-coupled device [CCD] camera, a light source, and a speckle-type background, making it a much simpler and less costly option for flow visualization.) This research effort is the first to use a BOS technique to visualize supersonic aircraft shock waves in flight. Work to date: The team conducted a flight test over the desert using a King Air aircraft equipped with a camera and recording an F/A-18 flying under it at supersonic speed. Researchers used the results to validate the BOS technique. Looking ahead: The team plans to conduct additional tests with more advanced cameras to obtain higher resolution images. The ultimate goal of NASA's shock wave research is to find ways to control shock waves and lessen their noise so that it may be possible for supersonic flight to become more routine. Supersonic flight over land is currently severely restricted because sonic booms created by shock waves disturb people on the ground and can damage private property. Since the maximum loudness of a sonic boom is not specifically defined by the current Federal Aviation Administration (FAA) regulation, innovators at NASA have been researching ways to identify a loudness level that is acceptable to both the FAA and the public and to reduce the noise created by supersonic aircraft. 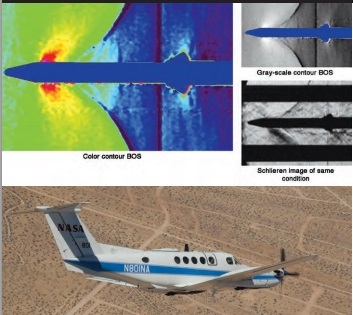 Using cutting-edge testing that builds on previous supersonic research, NASA is exploring low-boom aircraft designs and other strategies that show promise for reducing sonic boom levels. A variety of factors, from the shape and position of aircraft components to the propulsion system's characteristics, determine the make-up of a supersonic aircraft's sonic boom.